Use a tie-down to compress the rear suspension so that the front sprocket, swingarm pivot and rear axle are all in line with each other. 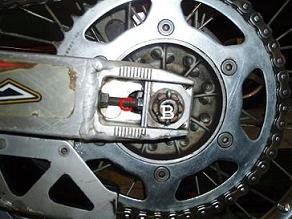 Use a piece of string running from the centre of the front sprocket to the rear sprocket to identify this. This is the point at which the chain will be stretched to its maximum. Tip: A quick and easy way to check the chain tension is to place your 3 middle fingers on top of each other (like a 3 fingered gun) between the chain and the back of the rubber chain guide on the front of the swingarm. You should only be able to fit those 3 fingers in. This is a good guide but will not be accurate if you have sausage fingers. Do this with your bike on a bike stand with the rear wheel off the ground. Loosen off the axle nut (B) until it is only lightly tightened. Wind out the chain adjuster bolts (C) evenly on both sides until you reach the desired tension. You will see the top of the chain rise as you wind out the adjuster bolts. Once you reach the correct tension, make sure both sides are evenly spaced (using the marker grooves on the adjuster blocks). Squeeze the chain against the swingarm with your hand to hold everything in place and tighten up the axle nut. Tighten up the chain adjuster lock nuts. Now you are ready to ride! Regularly check that the sprocket bolts are tightened as they can vibrate loose over time. Clean and lube the chain. If you are riding in the sand or really dusty tracks you are better off applying WD40, CRC or a silicon spray. Using a thick chain lube will only attract crap to the chain like teenage boys to a girly-mag. The best way to lube your chain is to place your bike on a bike stand and spray it while spinning the rear wheel. 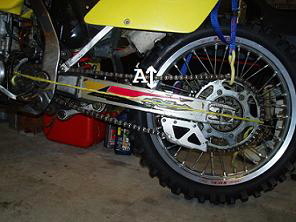 Replace the chain and sprockets at the same time. Chains stretch and sprocket teeth wear. Replacing them at alternate times will shorten their life span. Use a small front sprocket (countershaft) or larger rear sprocket. For every 1 tooth you change on the front, it is the equivalent to changing 3 teeth on the rear. Creates a lower gearing ratio. This is ideal for tight trail riding or tracks without many long straight sections. A lower gear ratio works well for Arenacross opposed to wide open desert racing. Creates a higher gearing ratio. Higher gearing ratios work well in high speed situations such as desert riding, sandy motocross type tracks or anywhere that does not have very many tight turns. As a general rule, for every tooth change on the front sprocket you are changing the rear sprocket by approximately three teeth. If you are looking for a subtle change in your gearing, add or reduce 1-2 teeth on the rear sprocket. Depending on whether you want to ride on tight bush trails, supercross tracks or wide open fast motocross tracks you may want to adjust your sprockets to alter the low-end power or top speed of your bike. The easiest and cheapest way to adjust the final drive, or gearing of your bike is to change the front sprocket. However, it is recommended you change both to get a better result. As a general guide, changing 1 tooth size on the front is equivalent to changing around 4 teeth on the rear. If you replace the front sprocket with a smaller one (less teeth) you will increase low end power but decrease the top-end speed - good for tight motocross or supercross tracks. If you replace the rear sprocket with a larger one (more teeth) this will do the same.